This is what my evening was filled with! 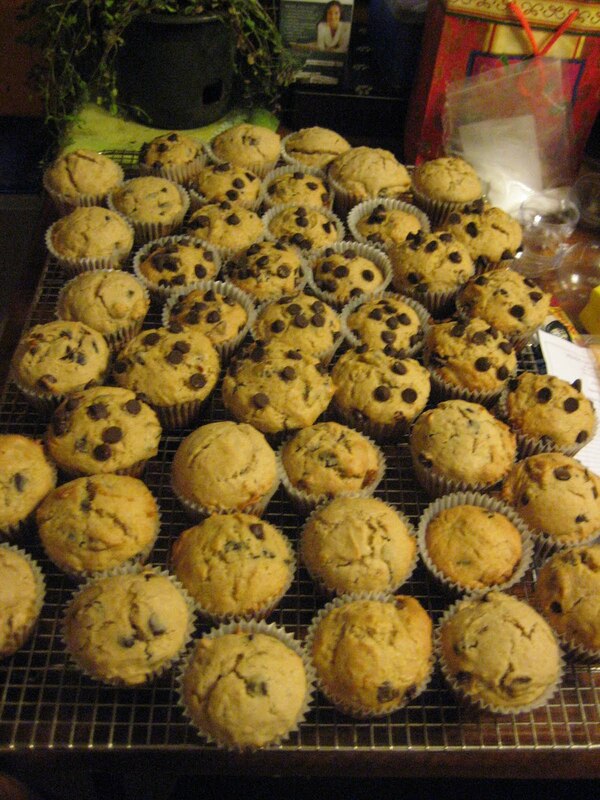 Baking tonnes of Banana Chocolate Chip Muffins for my sister in laws bake sale tomorrow! They are very yummy, so I thought I would share the recipe too! I didn't add the walnuts, though. 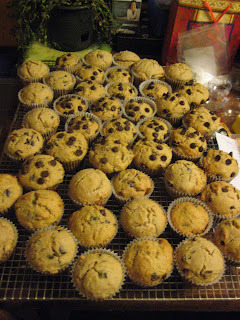 And for some of them I topped with some extra chocolate chips! I think I made around 120 of them!! puree bananas in blender or mini-food processor; measure 1 cup for recipe. Beat bananas, sugar, eggs butter and vanilla in medium bowl. Combine flour, baking powder, cinnamon and salt in large bowl. Stir in chocolate chips and nuts. Make a well in the center of dry ingredients. Add banana mixture. Stir until blended. Spoon into greased 2 1/2 inch muffin pans (or right into muffin liners). Bake 350°F for 25 to 30 minutes, or until toothpick inserted in centers come out clean.